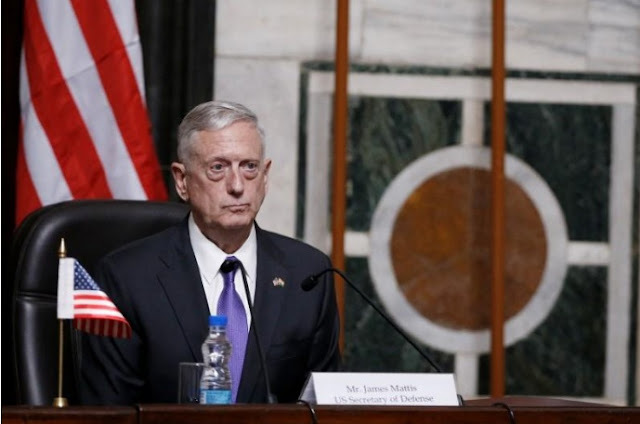 FILE PHOTO: U.S. Defense Secretary Jim Mattis listens to a question during a joint news conference in New Delhi, India September 26, 2017. CLARK, Philippines - The timing of U.S. Defense Secretary Jim Mattis’ trip to the Philippines this week couldn’t have been better, coming just as it celebrated a victory against Islamist militants in Marawi City - with a critical dose of help from the U.S. military. But as Mattis prepared to meet President Rodrigo Duterte on Tuesday, five Russian warships were parked off the Philippines and Moscow was preparing to formally hand over thousands of assault rifles, a million rounds of ammunition and 20 army trucks at a public ceremony on Wednesday. Just before he meets Mattis, Duterte was scheduled to sit down with Russian Defense Minister Sergei Shoigu on Tuesday, who, like Mattis, was attending a gathering of Asian defense ministers north of Manila. “I‘m not really threatened by this notion that China or Russia are providing some military equipment to the Philippines,” Kim told a small group of reporters traveling with Mattis. But even in Marawi, Duterte has also credited U.S. rival China for its assistance. The timing of U.S. Defense Secretary Jim Mattis’ trip to the Philippines this week couldn’t have been better, coming just as it celebrated a victory against Islamist militants in Marawi City - with a critical dose of help from the U.S. military.